US, 1987, 88 minutes, Colour. Kathy Ireland, Thom Matthew, Don Michael Paul, Linda Kerridge. 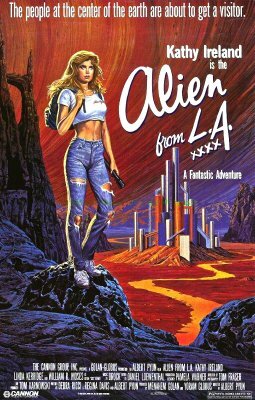 Alien from L.A. is an oddball reversal of aliens coming to Earth. This time a young Los Angeles teenager goes to a foreign civilisation as an alien and helps her father as an explorer and the aliens. It is comic-book stuff, rather complicated to follow - sensationalist at times in tone and oddball most of the time. It is of some interest because it was written and directed by Albert Pyun - who seemed to specialise in this kind of oddball film in the '80s. They are very striking, visually, with their bizarre landscapes and alien atmospheres. However, characterisation is not strong, there is a weird sense of humour - and the whole thing is somewhat bizarre. Other films by Albert Pyun include The Sword and the Sorcerer, Down Twisted, Radioactive Dreams, Cyborg.